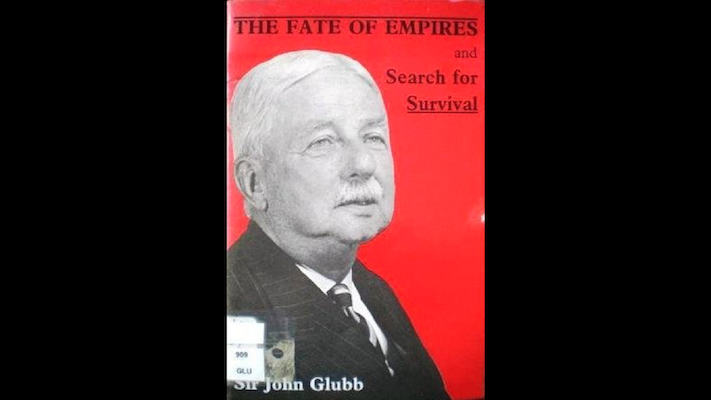 I recently came across this old but quite interesting book “The Fate of Empires and Search for Survival” by Sir John Glubb. The book was originally published in 1976, and is no longer in print. Old copies are difficult to find, but PDF versions of the book are available online. The book is only 26 pages. However, it packs quite a lot of thought-provoking information into such a small space. Sir John Glubb also proposes several controversial theories concerning the life cycle and demise of empires. Sir Glubb undertook a historical study of the lifecycle of empires covering a span of 3,000 years of recorded human history, from Assyria and Persia through the British Empire. He observes that all empires survive as empires for around 250 years, corresponding to 10 human generations. The book acknowledges that most empires do not have well-defined start and/or end dates. However, there is a reasonable degree of expert consensus on when a nation achieves the status of being an empire, and when such an empire fails or falls, reverting to a nation or falling under the control of a new empire. Sir Glubb further observed that all empires pass through six stages of existence. The Age of Pioneers (Outburst): The rapid development of a nation, often of insignificant status, to conquer rivals and become an empire. Pioneers are typically motivated by either greed or admiration of the existing empire. The Age of Conquests: This includes commercial expansion and dominance as well as military power and dominance. The Age of Commerce: The “glory and honor” of the Age of Conquest gradually is replaced by the desire to earn money and profit. The Age of Affluence: As wealth pours into the empire, the commercial classes grow immensely wealthy. Art, luxury, and architecture flourishes during this period. The empire shifts from the militaristic quest for glory, to the defense of its wealth, luxury, and privilege. Conquest becomes viewed as an immoral, uncivilized act, and pacifism achieves moral superiority. The Age of Intellect: Wealthy patrons endow colleges and universities, giving rise to the pursuit of knowledge. Interestingly, the author provides ample evidence for this period of intellectual development across 3,000 years of history. The Age of Decadence: The final period of empires, characterized by defensiveness, pessimism, materialism, and frivolity. The empire experiences a significant influx of foreigners, and transitions to a welfare state. Religious institutions are substantially weakened. Eventually, the empire spirals into selfishness and the loss of a sense of duty. Empires ultimately fail due to a diverse range of mostly external causes and forces, the result of the internal decay of the empire destroying its ability to resist such external forces. Sir Glubb packed this book with many direct references to many empires both ancient and contemporary. He patiently assists the reader in relating the rise and fall of historical empires to our modern empires, including Britain (1700 to 1950) and the USA (1776 to ???). I highly recommend this book for individuals with an interest for history. I also recommend this book for managers and leaders. I believe that some of these historical lessons attributed to empires can provide insight into the rise and fall of commercial empires and entities. Previous Previous post: Is Your Company Managing You?